Magnesium melting furnaces by Thermtronix® are available in stationary dip-out, hydraulic tilt/pour and removable crucible style furnaces. All MG-Series furnaces are also available in both electric resistance and gas fired models. Reliable, economical and efficient melting of magnesium is now a reality for any facility. Customers trust Thermtronix® uncompromised quality, safety and reliability. All MG-Series magnesium melting furnaces include solid state electrical and flame safety control panels engineered to meet or exceed all safety standards of Underwriters Laboratories, Inc. (UL). This leading edge technology provides maximum efficiency, precise temperature control and proven reliability. Just another example of Thermtronix® continued commitment to excellence. 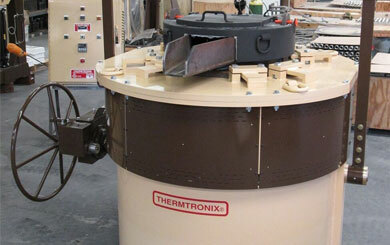 Thermtronix® stands behind each and every unit. All magnesium furnaces undergo rigorous testing under full load conditions and are shipped ready for operation. Additionally, all products are backed by an industry exclusive Total System Warranty that includes parts, labor and undeniable added value. We are a recognized worldwide leader in energy efficient, high performance, solid state electric and gas fired aluminum melting and holding furnaces for the foundry and die casting industries. Fill out the form below with your name, company, and email address to subscribe to our aluminum melting industry newsletter.